Since everybody, from Jairam Ramesh to Markandey Katju, has made malnourishment in Gujarat a cause celebre, it is worth noting what the Comptroller and Auditor General's latest report on the Integrated Child Development Scheme (ICDS) - whose focus is to eliminate child malnutrition in all states - has to say on the matter. The report audits the efficacy of the scheme, but it is the broader numbers it gives out in the process that seem interesting (Read the full report here). The survey, using data provided by the ministry of women and child welfare, updates the information to 31 March 2011, and shows a marked improvement for almost all states. And especially Gujarat. The Gujarat development model of private sector-led growth has been criticised for placing excessive emphasis on growth and less on human development indices. So this is as good a time as any to look at whether the growth model is incompatible with human development requirements. So how does Gujarat fare in these numbers? And the answer is: not badly at all, if one looks at change rather than raw numbers. If one were to rank it, Gujarat would figure somewhere in the middle of the national pecking order in terms of child development, which would seem to partially bear out Narendra Modi's critics that even with high growth, Gujarat does not seem to care as much for its children as it should. The truth is the growth versus human development juxtaposition is flawed. Gujarat is neither among the worst nor the best in terms of child malnourishment. In fact, the real laggards are also high-growth states such as Andhra Pradesh (49 percent malnourished), Bihar (82 percent), Haryana (43 percent), Rajasthan(43 percent), and, surprisingly Sheila Dikshit's rich Delhi (50 percent). But other high-growth states do well on malnutrition, with Maharashtra having more than 77 percent normal kids (i.e. 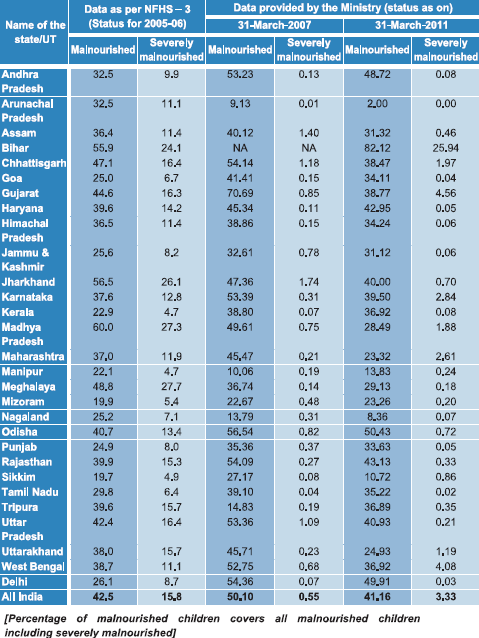 not malnourished), Madhya Pradesh 72 percent, and Uttarakhand 75 percent. So clearly it is not the Gujarat growth model that is the cause of the problem. But a closer look at the numbers tells a different story: a story of huge improvements in Gujarat over the last four years. As on 31 March 2007, the figure for malnourished children in Gujarat was the highest in the country - at 70.69 percent, well above the national average of 50.1 percent. But guess what happened by 2011? Gujarat is the most improved state with malnourishment down to 38.77 percent - the sharpest improvement in India. Not only that, Gujarat is now comfortably above the national average on malnourishment at 41.16 percent. 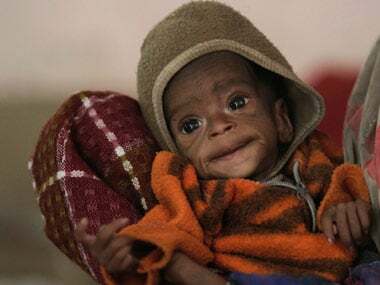 Says the CAG report: "There was substantial decrease in the malnourished children in six states (Gujarat, from 71 to 39 percent); Karnataka (from 53 to 41 percent); Maharashtra (from 45 to 23 percent); Uttar Pradesh (from 53 to 41 percent); Uttarakhand (from 46 to 25 percent): and West Bengal (from 53 to 37 percent). Clearly, Gujarat has topped in terms of the magnitude of improvements in addressing malnutrition. But there is no reason for it to take it easy. The number of severely malnourished children in this group of 38.77 percent is a high 4.56 percent for Gujarat. Bihar has 26 percent severely malnourished children, but it will be poor consolation for Gujarat, which surely has more resources to deal with the problem. Modi still has some serious work to do in the malnourishment area. Criticism of Gujarat on malnourishment is valid. Excess criticism is outdated.